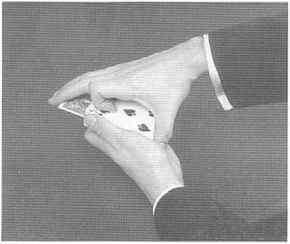 This is my technique for stealing a card from the deck and loading it into a wallet. The wallet is in the left inside breast pocket of your jacket, and the loading is a two-step process. The right hand is empty when you put the pen away and it is empty again when you reach in to take out the wallet. The explanation is followed by a wallet trick with business cards. Have a marking pen clipped to the same pocket which holds the wallet. The wallet I use is a Jennings style LePaul Card in Envelope wallet. 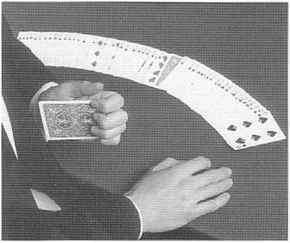 Have a card reversed on the bottom of the deck. Spread the pack face down between your hands and have a card selected. When the card is removed, square up the pack and give it a cut near the center. This places the reversed card near the center. Remove the marking pen with your right hand (] and hand it to the spectator. Ask him t to sign his name across the face of the ° selected card. 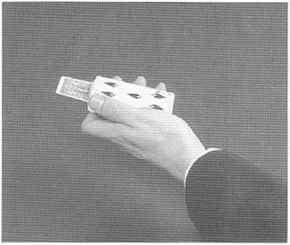 Hold the pack face up and squared in the left hand. 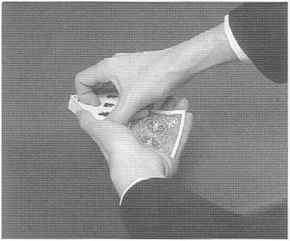 Take back the selected card face down with your right hand and insert it, face down, near the center of the face up pack. Push it in until only about half an inch protrudes. Ask for the name of the selected card. When it is named, smile, and say, "All is not as it seems!" 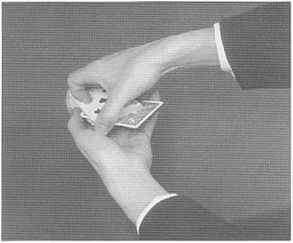 With your right hand reach forward and slowly turn face up the indifferent card in the center of the spread. Now say, "I stopped at the Post Office on the way over here and they had a letter for you." 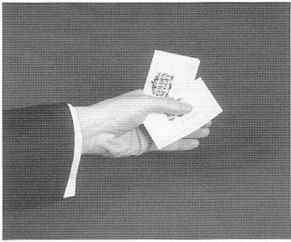 With a 0 clean right hand, reach into your jacket, t push the selected card all the way down into the wallet and, in this case, also $ into the envelope, and remove the wallet. As you remove the sealed envelope from the wallet say, "Signed, sealed, and delivered!" This is an Alan Okawa line. 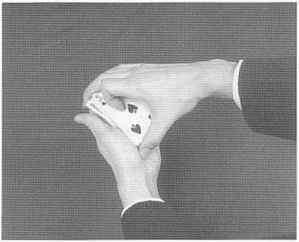 The right hand enters the pocket twice and, except for the pen, the right hand is empty both times. I Iere I will describe a short interlude with a packet of business cards that will endear you to your wife or girlfriend. Carry with you a stack of business cards, at least a dozen or so. All the cards in the stack are printed side up. On the blank side of the top card, print the words, "I love you darling!" Then place it on top of the stack, message side down. When ready to perform, have your wallet and marking pen in your left inside coat pocket. Have your stack of business cards, with a rubber band around them, in any available pocket. 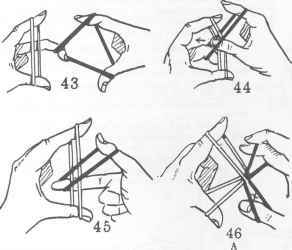 Remove the business cards from your pocket and remove the rubber band. 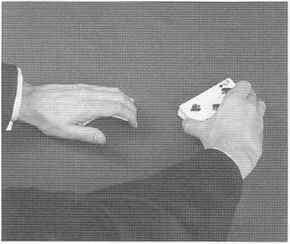 Perform a double turnover of the top two cards. A blank will show. 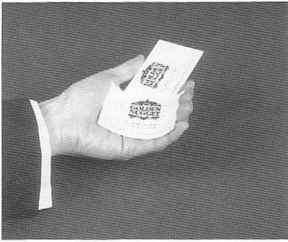 "Necktie" the packet slightly and deal off the top card blank side up onto the table. Tell the spectator that you are studying handwriting analysis and you need a sample of her signature. Remove the pen from your inside pocket and hand it to your spectator. 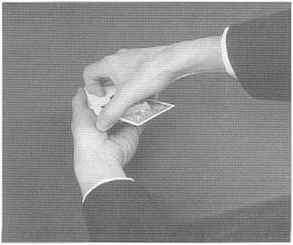 You are still holding the packet of cards in your left hand. Keep the tilted up that the message on die top card will be out gUJH^ of sight. 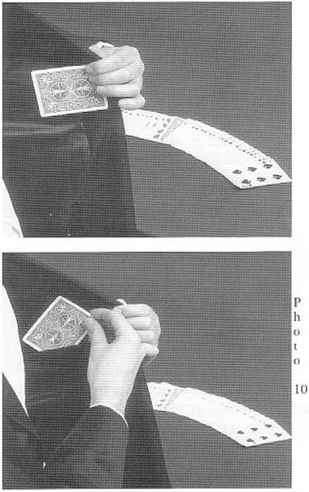 hand then falls naturally to the side with the card palmed. 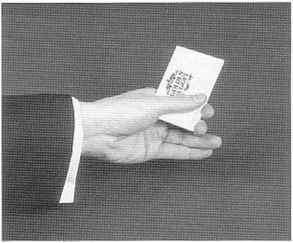 Now grasp the jacket at about waist level with the left hand that is holding the palmed card and perform the same operations to load the business card into your wallet and envelope, as explained earlier in this chapter-putting the pen away with your right hand, and so forth. around them and place them in your right side pocket. Now take out your wallet, pushing the card all the way into the wallet. Deliver the same lines as mentioned earlier, and let the spectator find his, or her, signed card in the sealed envelope. She will then notice the business card on the table and turn it over to read her sweet message.